OMNITEK ENGINEERING SELECTED FOR PORT OF SEATTLE PILOT PROJECT UTILIZING ITS DIESEL-TO-NATURAL GAS CONVERSION TECHNOLOGY. OMNITEK ENGINEERING PRESENTATION AT ROTH CAPITAL PARTNERS’ 25th ANNUAL GROWTH STOCK CONFERENCE CHANGED TO EARLIER TIME. OMNITEK ENGINEERING TO PRESENT AT ROTH CAPITAL PARTNERS’ 25th ANNUAL GROWTH STOCK CONFERENCE ON WEDNESDAY, MARCH 20, 2013. For complete Report For 10-Q on SEC Website. Omnitek Engineering Corporation today reports that it has been notified by the OTCQX that the company has fallen below financial listing standards and will be moved to the Pink Sheets on May 28th. Omnitek Engineering Corporation today announced the filing of a Form 10 registration statement with U.S. Securities and Exchange Commission to become a reporting company under the Securities Exchange Act of 1934, which will be effective as of June 28, 2010. As a reporting company, Omnitek Engineering Corp. will be required to file annual reports on Form 10-K, quarterly reports on Form 10-Q, and current reports on Form 8-K.
Omnitek Engineering Corporation today announced the appointment of Omnitek Stationary, Inc. as its exclusive distributor and installer of conversion technology for irrigation engines and other select applications. Omnitek Engineering acquired a minority ownership position in Omnitek Stationary, Inc. -- a privately held company based in Houston with offices in California. Omnitek Engineering Corporation today announced it has received international certification for its high-pressure compressed natural gas filter based on tests conducted by an independent agency and standards sanctioned by the United Nationals Economic Commission for Europe, specifically UN-ECE-110R. “The certification of our filter represents an important market expansion opportunity, with potential customers that include numerous internationally recognized original equipment manufacturers offering light and heavy duty vehicles powered by CNG – such as automobiles, buses and trucks,” said Werner Funk, president and chief executive officer of Omnitek Engineering Corporation. Omnitek Engineering Corporation announced it has signed a memorandum of understanding with Philippine- based Alternative Bio-Energy Technologies Company (ABET), with a goal of building a strong and mutually beneficial relationship utilizing Omnitek’s proprietary diesel-to-natural-gas conversion technology to address growing local market demand for biogas engine solutions. “Omnitek’s conversion technology complements ABET’s mission to create a cleaner environment in the Philippines, while promoting the use of environmentally friendly biomethane or biogas” said Werner Funk, president and chief executive officer of Omnitek Engineering Corporation. He noted that ABET is a leader in the design and installation of biogas energy systems in the Philippines -- utilizing animal waste, agricultural and food waste to create methane and biogas fuels. “This represents an inexpensive energy source for existing diesel generators to operate when converted by utilizing Omnitek’s diesel-to-gas technology,” Funk said. “Omnitek’s diesel engine conversion technology is being applied throughout the world with great success. Applying this technology also in the Philippines would add a significant number of biogas-powered generators in a short timeframe at an economical cost well-below the price of a new engine,” Funk said. Omnitek Engineering Corporation today announced it has been granted a license from the government of Peru to perform diesel-to-natural-gas conversions in the country. The conversions will be performed under a Productores de Equipos Completos, or PEC (Complete Equipment Producers) license. Omnitek announced results of a study conducted by The Southern California Gas Co., a Sempra Energy Utility, to determine the effectiveness of the company’s technology for the conversion of a turbocharged Cummins GTA855 irrigation engine. The evaluation of Omnitek’s natural gas conversion technology recorded a 20-25 percent improvement in fuel savings and reduced emissions well within compliance of San Joaquin Valley Air Pollution Control District Rule 4702. The results were obtained based on rigorous monitoring and measuring during several test cycles conducted at Crystal Organics, an agricultural operation located in Bakersfield, California. 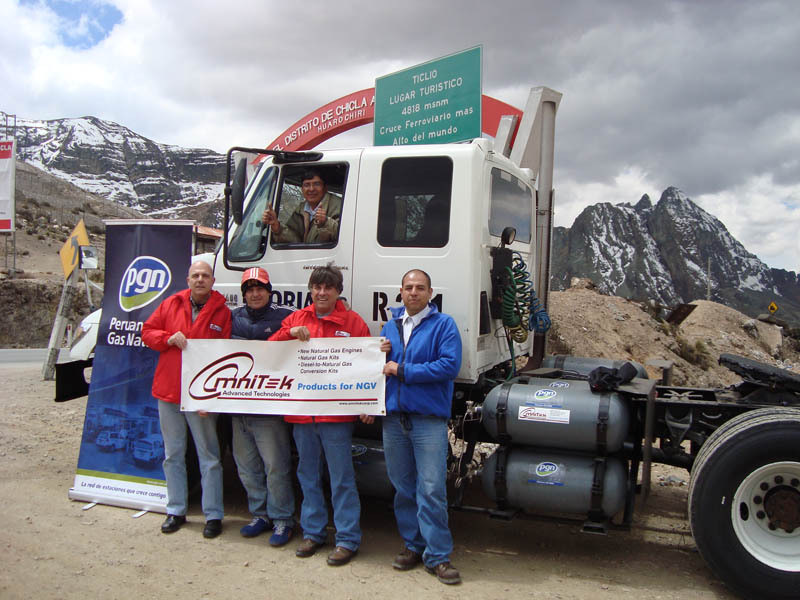 Omnitek Peru made history by driving a natural gas powered heavy-duty commercial truck to a record altitude of 4,814 meters (15,800 feet) over the Ticlio Pass high in the Peruvian Andes, the highest poad in the world. The truck manufactured by International Truck and Engine Company and equipped with the 275 horsepower DT530 engine, had been converted from diesel to natural gas using the Omnitek technology. Omnitek Engineering Corporation today announced it has formed a joint venture with local partners in Peru to convert diesel engines to operate on natural gas, as well as provide services to re-power diesel trucks and buses utilizing Omnitek's natural gas engines. Based in Lima, Peru, the joint venture will operate as Omnitek Peru S.A.C., with plans to expand from several initial conversion centers in Lima to numerous other locations throughout the country. "Peru represents an important growth market for our company. The country's natural gas infrastructure system is excellent, with Peruvian bank loans readily available to fleet operators for conversions and diesel engine re-powering. In addition, support by leading energy suppliers, such as PGN and Petro Peru, will contribute to a rapid expansion of the natural gas market," said Werner Funk, president and chief executive officer of Omnitek Engineering Corporation. Omnitek Engineering Corp. today reported results for its fourth quarter and year ended December 31, 2008, with revenues increasing more than two-fold on a year-over-year basis due to strong demand for its diesel-to-natural gas conversion systems. Omnitek Engineering, Corp. today reports that shareholders can experience Omnitek's 2008 Annual Meeting of Shareholders held November 15, 2008, via audiocast. The audio portion of the annual meeting can be accessed by downloading the audio file from the Omnitek website. Omnitek Engineering, Corp. (OMTK) today reports record results for the 3rd quarter of fiscal 2008, ending September 30, 2008. Revenue for the three months increased to $1,175,171 from $334,064 for the same period in 2007. Profit was $31,641 compared to a loss of $26,757 for the same period in 2007. Revenue for the first nine months of fiscal 2008 increased to $2,673,449 from $678,446 for the same 9 month period in 2007. Omnitek Engineering, Corp. (OMTK) reports record results for the 2nd quarter of fiscal 2008, ending June 30, 2008. Revenue for the three months increased to $961,102, from $205,799 for the same period in 2007. Earnings before interest, taxes, depreciation and amortization (EBITDA) were $156,488 for the second quarter of FY08 compared to a loss of $ 42,752 for the same period in 2007. Omnitek reports the receipt of Notice of Allowance from the United States Patent Office for a key technology, essential for achieving ultra-low emission levels with natural gas engines. The technology greatly improves air/gas mixture formation. The resulting complete combustion greatly reduces emissions and increases fuel economy. Omnitek plans to make this technology available to other engine manufacturers, such as Cummins, Volvo, Isuzu and Mercedes, in an effort to support the fight to lower air pollution and combat global warming. Patent Serial Nr. 11/810,620. International patents pending. Omnitek Engineering, Corp. (OMTK) reports record results for its first quarter of fiscal year 2008, ending March 31, 2008. Sales for the quarter were $537,176, up from $138,584 for the comparable quarter in 2007. Earnings before interest, taxes, depreciation and amortization (EBITDA) were $13,114 for the first quarter of FY08 compared to a loss of $87,391 for the same quarter last year. At the close of first quarter FY08 the company's backlog of firm orders grew to $1.35 million, compared to $39,000 for the comparable quarter in 2007. Omnitek’s CEO, Werner Funk, reports, “Sales volume of our diesel-to-natural gas conversion systems is on track to mark another record for 2nd Quarter sales." 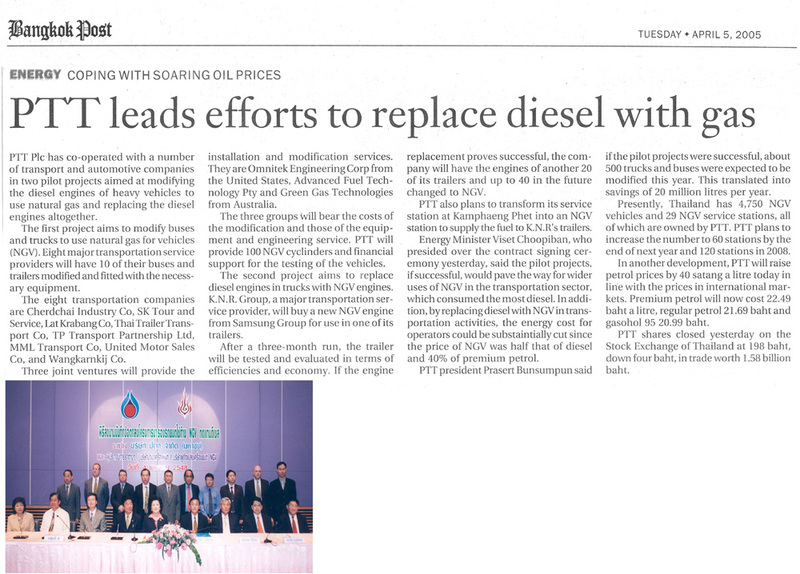 Omnitek Engineering, Corp. (OMTK) and Omnitek Engineering Thailand Co. Ltd., have entered into a joint venture agreement in Thailand to sell Omnitek’s proprietary diesel-to–natural gas engine conversion kits and new natural gas engines used to repower existing diesel trucks and buses. Omnitek reports a 15% interest in the JV. Omnitek Re-powers Container Handling UTR at Bangkok Sea Port - Omnitek reports the commencement of a re-powering project at the Bangkok Laem Chabang Sea Port. The first two UTR container-handling vehicles, owned by LCB1 Ltd., were recently put into service. The Cummins 5.9 Liter engines were replaced with Omnitek 5.8 Liter CNG engines. 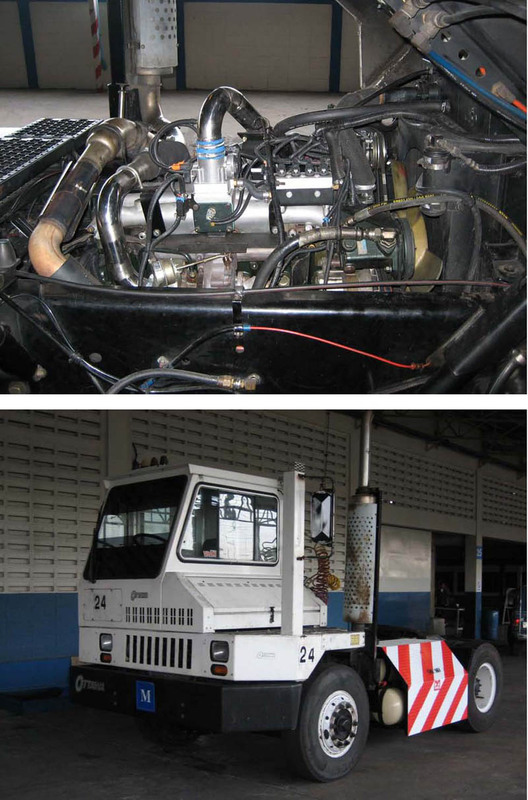 The engine of a third UTR is currently being converted from diesel to CNG. A short evaluation period will determine the economics and feasibility of converting or re-powering. LCB1 Ltd. operates approximately 200 UTRs at the Bangkok port. Omnitek Acquires Pensare, Inc. - Omnitek announces the acquisition of Pensare, Inc., Woodland Park Colorado, one of the leading manufacturers of components for the natural gas industry. With this acquisition, Omnitek adds substantial engineering talent to its workforce and expands its product line further. The production of Pensares high-pressure CNG filters will be moved to the Omnitek factory in California. The coalescing filters are designed to meet the needs of medium and heavy-duty gas engines. Made out of high-strength aluminum they feature a unique multi-layer filter element that combines both particulate and coalescing filtration. Omnitek is now offering the Carburation and Ignition Management System (CIMS) for 8-cylinder engines. It was specifically designed for Diesel-to-Natural Gas conversions and features an integrated ignition and carburetion control system to manage the closed-loop gas metering and ignition timing for highest engine power and lowest fuel consumption and emissions. Primary applications are 8-cylinder power-generators, but the reliable and robust system can also easily be integrated into retrofit and OEM truck applications. The CIMS features enhanced closed-loop fuel control for lowest emissions and fuel consumption. The CIMS features a switch selectable 2nd ignition map for low-grade fuel applications. All CIMS models now come with upgraded software features and sensors that are compatible with turbo charged engines. 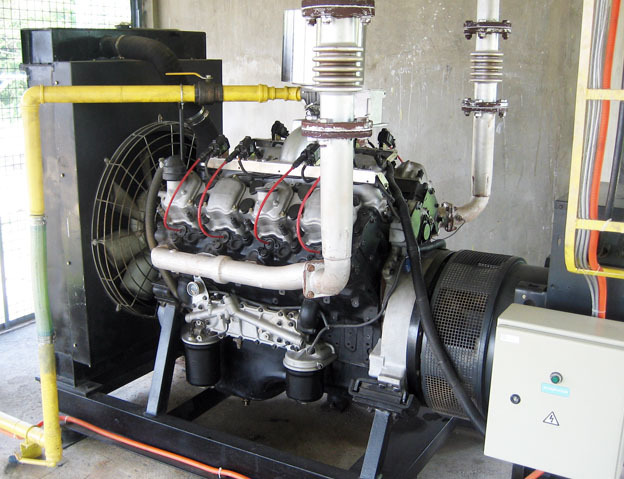 Omnitek is happy to report that one of it’s 200 horsepower natural gas engines has completed a 50,000 km demonstration project in Thailand and has surpassed all expectations. The 8-month project resulted in an average savings to the operator of 63% in fuel costs alone. Maintenance costs were also lower when compared to a diesel engine. The vehicle was a cement truck, covering about 400 to 500 km every day. Local support came from the Omnitek representative in Thailand, E2E Co.,Ltd., who was also responsible for system integration and scheduled maintenance for the engine. Omnitek receives US patent for an advance diesel dual-fuel (DDF) conversion system. The Omnitek DDF System can be used to convert high polluting diesel engines to operate with a mixture of diesel and natural gas, without any internal mechanical changes to the engine. The mixture of diesel to natural gas can be up to 40% diesel and 60% NG. By installing the DDF System, great savings in fuel costs can be achieved. The Omnitek DDF system costs less than traditional engine conversions and can be applied to small as well as large engines. US Patent Nr. 7,019,626. International patents pending. Omnitek concludes delivery of first 500 conversion kits for Myanmar. In a cooperative effort with Altenergy India LTD, New Delhi, Omnitek has contracts to supply a total of 1200 kits to convert diesel buses to natural gas to Myanmar. Myanmar has one of the larges natural gas reserves and is planning to convert up to 5000 buses and delivery trucks to natural gas.